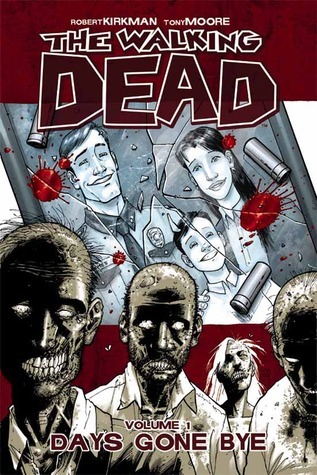 This short post is my thoughts on the first three volumes of The Walking Dead series; Days Gone Bye, Miles Behind Us and Safety Behind Bars. It will be different to my normal reviews as it is kind of a summary of my thoughts towards the comics, especially after having watched the three seasons of the TV series. I watched the TV series and played part of The Walking Dead video game before I got round to reading the comics. I wasn’t even sure I was going to read them but my partner started them and told me I had to, now I’m glad I did. The comics are so different to the TV series that it took some getting used to, people didn’t look the same, they had slightly different personalities and relationships were different to what they are in the show. This took some getting used to in the first volume but by the third I was a bit better with it. I I read the three volumes over the space of three days, one each evening. This made them seem a little rushed and I didn’t connect to the characters as much as I have connected to those in the TV series at first. I think I understood the characters better in the comics after they had been introduced because of the events that happened differently. I really liked what happened with Shane the most and appreciated it more in the book than I ever did watching the show. I had trouble separating the two mediums that I associate the series with and the pacing in the books is a little harder to grasp, however once I thought about them as a separate entity I started enjoying the comics a lot more. Its always the case with a graphic novel or a comic that you have to think more about the timing of the story and the outside story a bit more because you don’t get any narration, its just pictures and speech. I love the art style of the comics and the black and white really helped keep my imagination flowing, it helped keep the gore factor a little lower too which helps with recommending the comics to those who have heard of it but are put off by the zombies. With any graphic novel a lot of the description and the story comes from the art, there are speech bubbles but other than that you have to rely on what the pictures are showing you and occasionally when reading them I find myself skipping over the images a bit too much. With The Walking Dead volumes 1-3 I had to make myself slow down to appreciate them, the story is told brilliantly to the point where you can see the emotion clearly on each characters face and I loved that. The comics explore more of the emotional impact that the world would have on people. There are more moral questions approached in the comics, this is what made it feel even more realistic. It seemed to me that Kirkman was trying to make a point with these early comics, a point about the state of society and how different people would react in different ways. That is a lot of what the comics are built upon and I can’t wait to be introduced to more characters to see how they are coping with the surroundings. I really did like the comics but I think I should have started off with them rather than the TV show. I am going to continue with my reading of the series and am very excited to be introduced to the governor, who I believe is very different from the TV show, and Michonne. With the morals questioned and the style of the books they are an intriguing read for me and I honestly think I will grow to like the comics more than the show. Sorry if this post seems a little more ramble-y than usual, I read the three volumes whilst moving house and didn’t get round to a proper review until a week after I read them. However I do think Graphic novels are the way forward if you want to chill out and read something which you know won’t take too long! Thanks for reading! For more information about The Walking Dead please visit the publisher, Image Comics, webpage. However please note that this page does contain covers for the later comics which may contain spoilers for anyone who hasn’t read the comics or isn’t as up to date with the series. You can also view the goodreads pages for each volume mentioned in this post; here, here and here.